I am a freelance DoP/producer/editor/stereographer…. jack of all trades perhaps, that has worked in broadcast television since 1984. I studied electronics to degree level and my first job was helping design microwave links for TV and radio O.B’s. Then I went to work for Aston Electronics in the service department looking after caption generators. Then in 1999 I got a commission from National Geographic to produce a one hour special about Tornado Chasing. The programme which aired internationally (Twister Tours) was a big hit and introduced me to severe and extreme weather. I have always enjoyed watching thunderstorms, ever since I was a child but the combination of adventure, danger and the challenge of getting top quality footage of extreme weather is something I find irresistible. Since then I have specialised in filming natures extremes and this has taken me up to the Arctic in winter to shoot the Northern lights, to the deserts of Arizona for monsoon thunderstorms as well as countless tornado and hurricane chasing adventures. My weather footage is used in all kinds of programmes from kids TV shows to BBC natural history and even a few feature films. It’s quite likely that you will have seen it somewhere tucked away within a TV show, museum exhibition or web clip of some kind. Don’t get the wrong idea, I don’t just shoot the weather! I continue to shoot occasional motor sports events as well as a lot of airshows and aviation programmes. I produce many hours of corporate videos every year and in 2004 I started working with 3D using a Nu-View stereoscopic camera adapter. For the past 3 years have even been making big budget stereoscopic 3D programmes using my own stereoscopic camera rigs, recent camera developments have made it much easier to shoot 3D well, even with only small budgets. I enjoy the challenge that 3D presents, it is a much more technical exercise than 2D. I now have many highly regarded stereoscopic films to my name as either camera operator, stereographer or S3D consultant. S3D clients include Sony, Toyota, IBM, and Discovery/IMAX. As well as shooting S3D I also run introductory workshops for those interested in getting a better understanding of how it works. In the past year alone I have consulted on major projects for New York museums, worked with the military, provided stock footage to over 30 different clients, produced corporate videos and filmed for the BBC, Sky, NBC and Discovery. In between all this I have run workshops on various cameras and 3D production for Sony, equipment dealers and the VI academy. 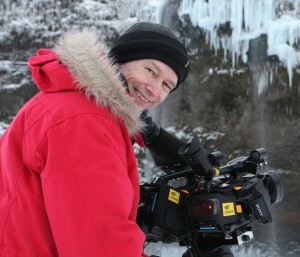 When I started out as a cameraman I found it very difficult to learn about how to set up cameras. In some respects this is seen as a bit of a dark art, not because it’s technically difficult, but because it is very subjective. Over the years I have learnt a vast amount about cameras, filming techniques and related equipment. Now I wish to share some of that knowledge and encourage others to delve into their cameras menus and et the most from what for many people is a considerable investment. The Sony Connection: First let me say that I am not an employee of Sony. I have been using Sony cameras since the 80?s and they have always served me well. I have also used and owned cameras from Panasonic, JVC and Ikegami. Over the years I have gained a great deal of experience with these cameras. With my engineering background I am not afraid of trying new settings and tweaking my cameras and equipment for the best results. For many years I have written about my settings and methods in magazines, in forums and on blogs. I have often been an early adopter of new technologies. Back in the 80?s I developed some of the very first in-car camera systems using newly invented CCD cameras recording on to specially modified portable Betamax recorders, while others were still using tube cameras and u-matic. 5 years ago I purchased one of the very first XDCAM HD cameras to be delivered in the UK. As a result of my experience with this camera and the EX1, EX3 and PDW-700 that I have also purchased, Sony pay me to help run workshops as part of their EXperience campaign. I get paid for the day of the workshop and any travel expenses. I do also get paid to write reviews of equipment or features and articles on workflow and camera setups etc for the Sony web site. However, I make much more money as a cameraman than I do in connection with Sony. At the end of the day as a cameraman it is vital to me that I choose the most appropriate tools for my job. I am always on the look-out for tools and equipment that will allow me to improve the quality of my work, from ANY manufacturer. At the moment I am happy to be using the Sony XDCAM family as it offers a range of cameras capable of great pictures at competitive prices. Yes, I am a fan of Sony equipment, but I have a reputation to maintain as an independent cameraman, so I would never put my name to a piece of kit that didn’t do what it was supposed to. I try to be objective in my reviews and look at the facts, pro’s and con’s of each piece of kit. Alister, Sorry to heare about your web site. I hope it gets fixed soon. I sent you an email, realising after you may not reply to it and find it dificult seeing where to put comments other than here. As mentioned I am a defence engineer of 12 years and have been filming for 7 now with a reasonably successful business for marine, aerial, corporate, tv, educational and web work. As mentioned for a while I happily worked with PDX10P, DSR 390 450 and PD170s. I am now using EX1R, EX3 and PMW 350 with nanoflash anda lot of custom made kit, having a workshop and electro mechanical fabrication/assembly facilities. I also use Sony Vegas8/9 and occasionally final cut or avid. My question was what is the best way to downconvert my films to SD? I almost always film in 720p50 unless told otherwise and only now and then do I output to DVD. using the EX series I am now having less than ideal results and people must have some ideas of a work flow for improving this. I still produce useable DVDs but no where like what I coudl get going back to my old cameras. If you have any comments on things I can try Id be very interested. I’m going to have to write an article on this as it causes a lot of people problems. basically you need to soften the HD image before converting to SD. Prestine SD from HD footage can be obtained purely through careful rescaling and encoder workflows. From a Mac perspective Compressor is all you need – frame controls are used for high quality scaling but be sure to optimise Compressor jobs to avoid encoding blowing out to days i.e. set-up Quickclusters and job segmenting. That’s fine for a software conversion, but the camera settings best suited to HD will look soft in SD. The detail correction edges will be too thin and will lead to jitter and aliasing. A good downconversion helps, but it will always be a compromise situation. I love your very informative site. I wanted to ask you about the mtf nikon g and e-mount adapter for the fs100. You mention it has a baffle/choke. Is that really necessary for nikon lenses onto the super35mm sensor? How, exactly does not having a baffle increase flare potential? It is vital that any adapter that you use with the FS100 has a baffle or choke at the camera end of the adapter. If there is not one, light passing from the edges of the lens can hit the extreme edge of the sensor window in the camera and reflect on to one side of the sensor chip causing a bright vertical band to appear down one side of the image. I have seen this in several shots done with a non baffled adapter. Interesting… and am I right to believe MTF is the only manufacturer that includes a baffle in their adapters? I wonder why their competition doesn’t. Thank you for your seminar during Broadcast Asia 2011. Nice to know you and especially your shares of the basic-rules techniques of Stereoscopic. My question regarding what should be avoided and okay-to-do on 3D shooting complexities is now widely answered. Wish you best on your career! I’m really pleased that you found the workshop helpful. If you have any further questions please feel free to ask them here using the comments option. Alister … what’s the skinny on the F3 converter lens for a 2/3s ENG lens? Has it gotten into production yet? Hi Dean. It should be in production. Mike Tapa at MTF is doing them. We met briefly at a seminar in Denmark that I hosted, and I forgot to get your opinion on something. I have always been looking for a way to shoot film like video, making short films and other productions for the net. So I bought a Sony Z7e, and I’ve tried various lens adapters for that. The Redrock Microsystem using nikon photolenses. That works pretty good, although it’s a bit of a christmastree-like attaching all the equipment on the camera. But my question is, what Adaptersystem is the better for the Z7e, or should I buy the panasonic AG AF100. The sony F3 is of course the best choice, but a bit over my budget. The reason why I bought the Z7e was that it had a changeable lens, and I thought I could achieve the DOF I was looking for by changing lenses accordingly, but they only come with a wide-angle and a standard lens, and if I use a lens adapterring, I am told that I won’t get the shallow depth of field that I’m looking for. So any suggestions to what lensadaptersystem could solve my problem or must I upgrade to F3?! The problem with the Z7 is that it has a very small sensor compared to a film camera etc. As a result it will be very difficult to achieve shallow DoF without using a system such as the Redrock that you have already tried. So what you need is a camera with a bigger sensor. The lowest cost option would be a NEX-VG20 which is a video camera based on a photo camera. It’s not bad, but as you are already used to professional camera like the Z7 you may find it a bit too “toy” like. Next up is the Sony FS100. This has the same sensor as the Sony F3 and the images are very similar. It uses AVCHD to record but is still a professional level camera with pro audio connections and full manual control etc. Via a low cost lens mount adapter you can use Nikon lenses without the whole thing becoming a big long mess (mtfservices.com Sony E mount to Nikon). I think the FS100 is quite a bit better than the AF100 and it will give you images extremely close to those of the F3 for 1/3 of the price. We are using the EX1R to film an Archaeology documentary which we hope to submit to the BBC HD. We have been informed that they only commission HD programs with the format ‘MPEG2 50 MBPS Long GOP with 4.2.2 colour’ and as you most probably know the EX1R shoots ‘MPEG2 35 MBPS Long GOP with 4.2.0 colour’. Can we upscale/convert the footage in postproduction or is the Nano drive route the only solution? We have converted test footage from 35mbs to 50mbps and also to 4.2.2 colour sampling but we have no way of analyzing the results. Neither QT of FCP will give us the colour sampling information. You will need to use an external recorder. There are many options, NanoFlash, Samurai, Ninja, Sound Devices etc. All of these can do 4:2:2 at at least 50Mb/s. If you are caught trying to pass off 4:2:0 as 4:2:2 you will not get paid and may face heavy penalties plus, if the show does get commission you would be required to re-shoot at you cost. I have read most of your posts regarding the Gemini 444 recorder when being used with PMW-F3 S-log, they are indeed very helpful. Now I have been shooting 444 Uncompressed S-log HD and have fallen in love with it, but now the workflow is killing me. I am using Gemini Universal thunderbolt transfer station and 17 Inch 2o11 Macbook Pro (4G RAM, with no special video card installed) with FCP 7 Gluetools DPX version installed along with Apple Color to review my footage and it works but my computer maybe is not really fit for it I have had a lot of trouble with the DPX files sent to color when color correcting. After reading some of your tests, I know that transcoding is not the best thing to do (as it adds unwanted noise) but I read transcoding to DNXHD is the best way to go if needed vs. Pro res. Now will FCP 7 will be able to allow to use DNXHD 444 files? Or what workflow would you recommend to use GEMINI 444 quality out from the PMW F3 and not drowning with DPX huge files and storage needed or at least make this chore not as painful. Thanks in advance for sharing your knowledge. I am cameraman for RAI in Italy and follow your news and workshops. Keep it up I like your tips and info. Thanks, I’ll try, but the blog has to fit in between paying jobs!